As the first storm approached the coast last Sunday, the “Nanny State” tried to close the beach. The public was not impressed. Not a good day for a swim. 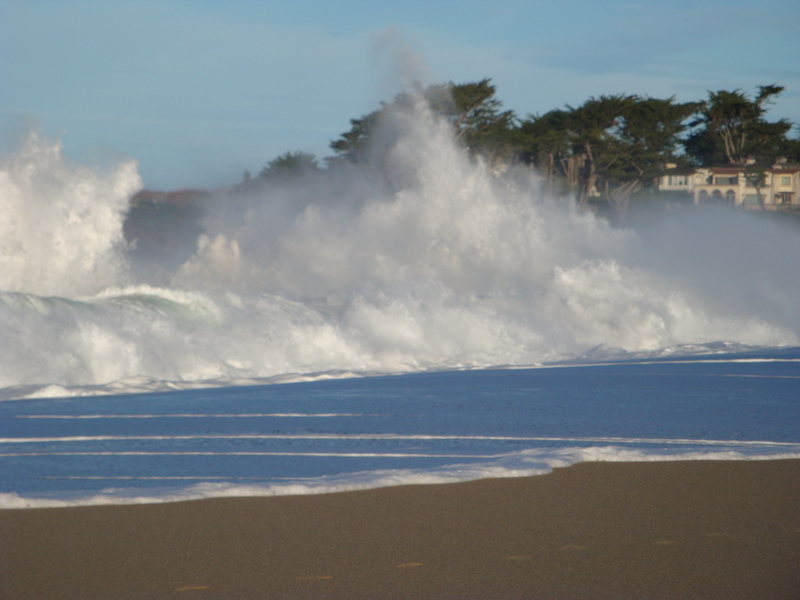 By Tuesday a 25 foot swell was jacking up some even more impressive waves. 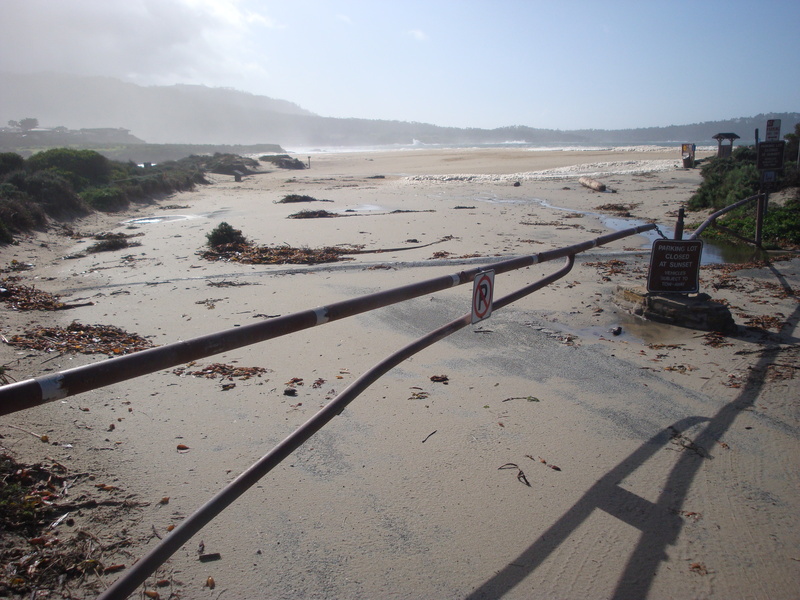 Carmel River Beach parking lot overrun by waves. 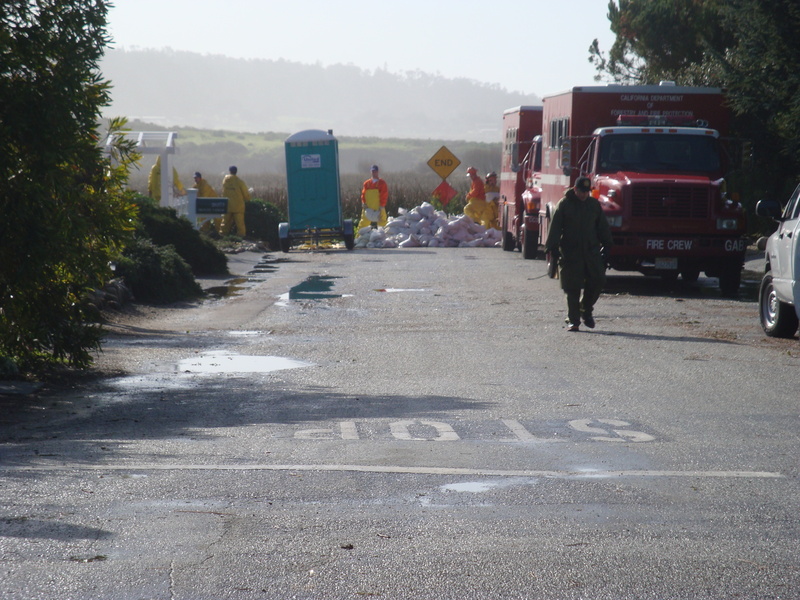 Sandbagging crews work to protect the lagoon-bottom homes. 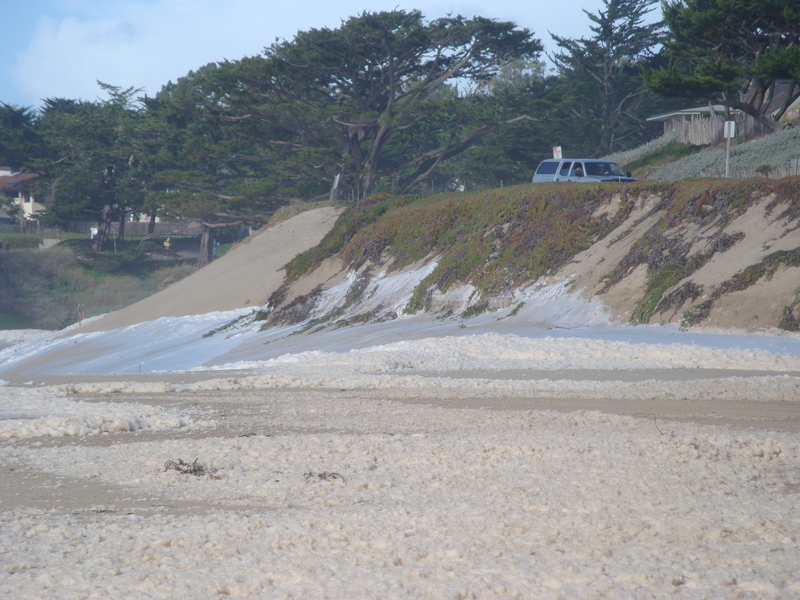 Waves erode the sand dune supporting Scenic Rd. 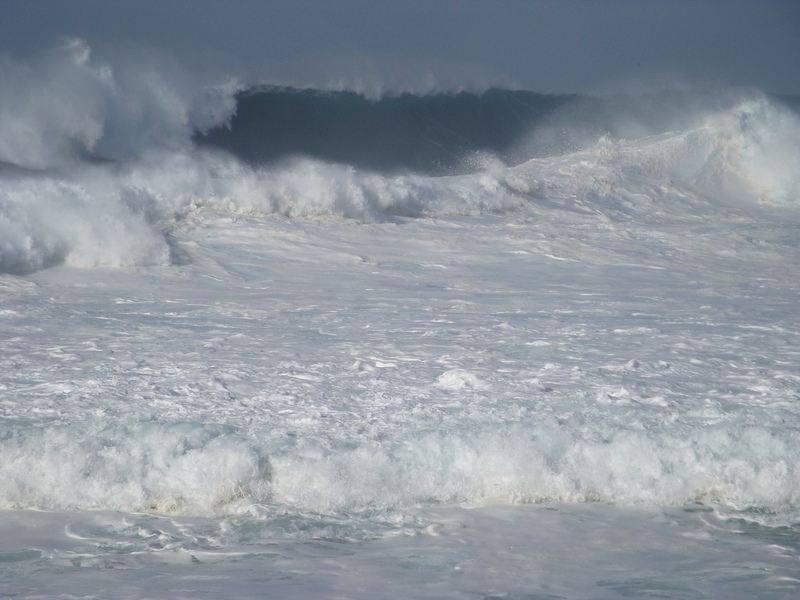 It’s lucky this surf didn’t arrive last week – when the tides were running three feet higher. The beach-fire zone at the foot of 13th Ave. gets a thorough cleaning. 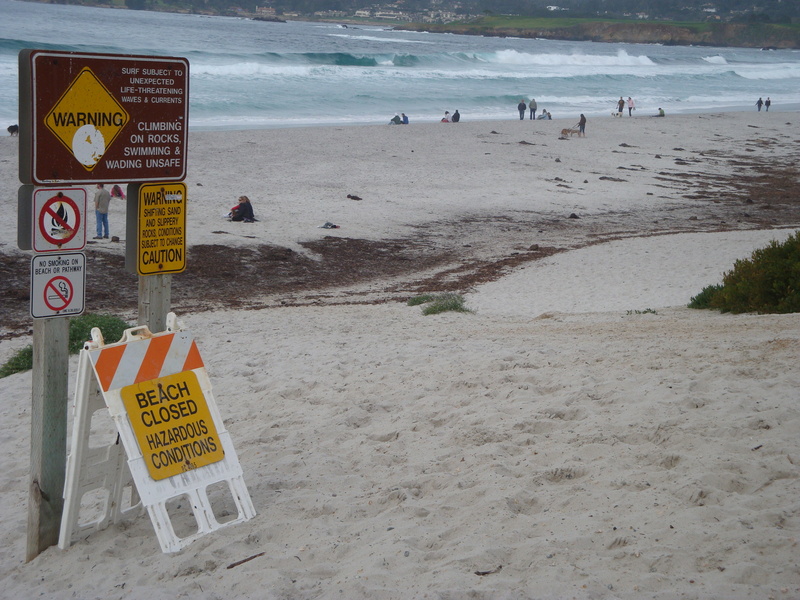 Today the beach is closed for real – no sign needed. We’ve had four storm systems come through in four days (with plenty of scattered thunderstorms in between), and another system is expected to come ashore tomorrow. Yet, thanks to the speed of the wind, the storms have been passing over us so quickly that rain accumulations have not been high – at least by Coast Ridge standards. It now seems likely that gauges like Mining Ridge (above Big Creek) may end up recording less rain for this entire week of storms than the 20 inches plus they logged in a little over 24 hours when the remnants of Typhoon Melor drenched us back in October. 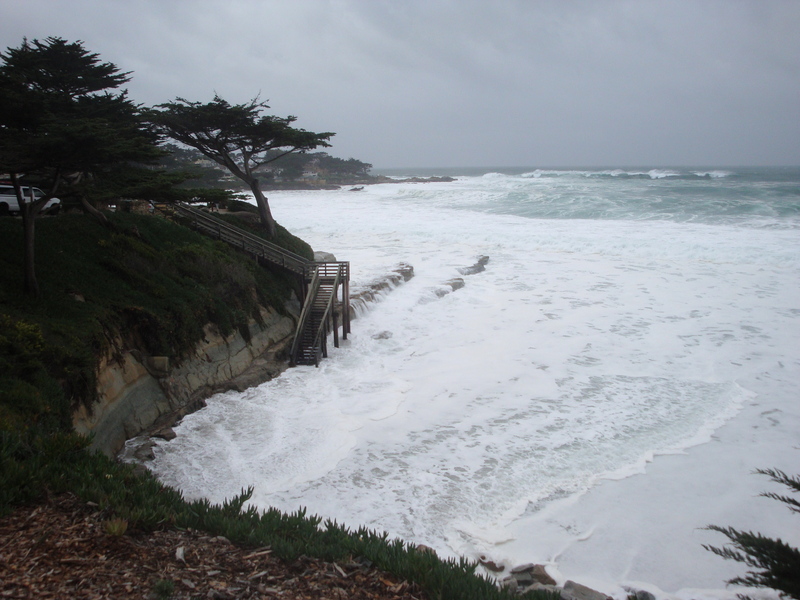 The only stream to approach its October flows, so far, has been the Nacimiento River, which peaked at about 18,000 cfs around noon today – something that will certainly be welcomed by the Monterey County Water Resource Agency. 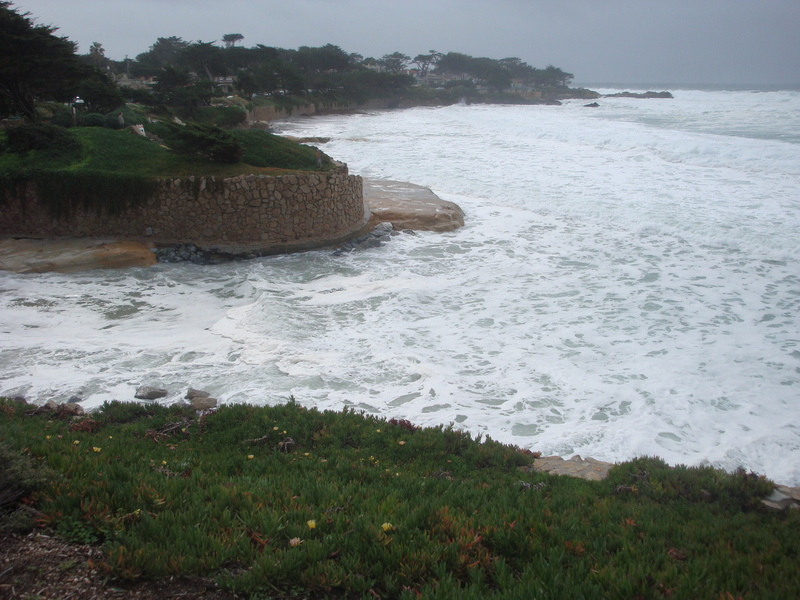 This entry was posted on Wednesday, January 20th, 2010 at 4:17 pm and is filed under Coastal Development/Erosion, Fire, Flood & Apocalypse. You can follow any responses to this entry through the RSS 2.0 feed. You can leave a response, or trackback from your own site. When asked this fall, the MoCo folks responsible for installing and maintaining the automated gauges confirmed with me that the totals from certain wind-exposed sites like Three Peaks and Mining Ridge are still inflated. The older tipping bucket design oscillates due to a venturi effect in high wind events. The error varies but the best estimate was perhaps 13 and not 20 inches total for the October event down at Three Peaks and Mining Ridge. FWIW. That wild October day, I got 15.5 inches up here at the top of Plaskett. Mine is an old-fashioned rain gauge, no venturi effect, dumped by an old-fashioned mountain woman, by hand, So while Mining Ridge “might” be slightly inflated, it is not by much. So glad the MWRB did not seed the clouds this winter. Imagine what that would have been like?